As I mentioned in yesterday's post, when we got to Fort Worth last Thursday, my sweet friend's mom was eager to get us whatever we needed and even fixed us this yummy snack! We had worked up an appetite after our little road trip! It's basically a mediterranean layer dip, and you can really use whatever you have on hand. This one used hummus, chopped artichoke hearts and tomatoes, toasted pine nuts and tabbouleh. Toast your pine nuts over medium-low heat on the stove (watch them carefully, they toast quick). Spread the hummus evenly along the bottom of a pie pan. Distribute artichokes over the hummus. Top with an even layer of your tabbouleh. Lastly sprinkle your tomatoes and pine nuts over the top. I also mentioned last week how I got a huge shipment of hummus sent to me...well a few weeks ago, Eat Well Embrace Life Hummus contacted me seeing if I would be interested in being a brand ambassador for their company. You're saying I get to eat and promote hummus? I'm in! Basically I just get to talk about their yummy hummus a lot and use it in some of my recipes. 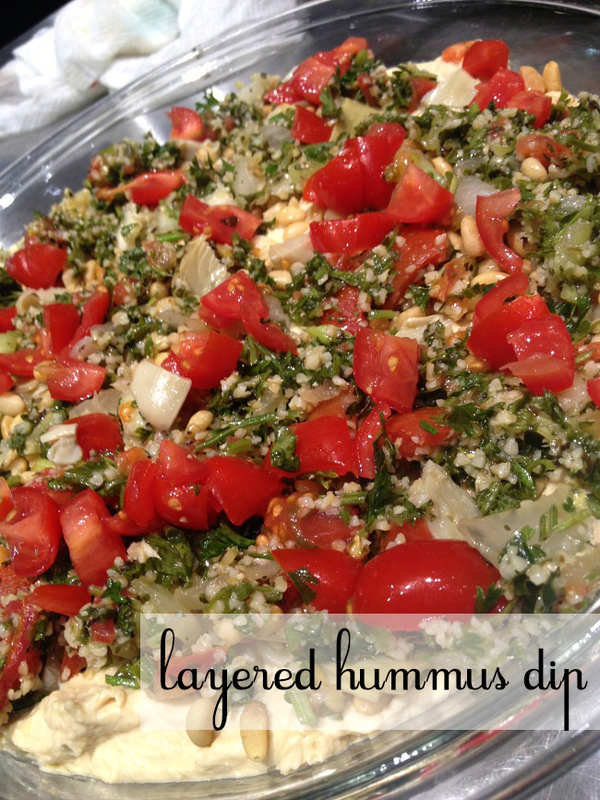 This layered dip would be perfect to use EWEL's hummus! I'd suggest using their white bean, classic, roasted garlic or roasted pine nut flavor in making this dish! You can find EWEL hummus in most specialty grocery stores (If you're from around here check Sprouts!). If you are trying it for the first time, I suggest the spicy black bean or yellow lentil flavor. They are my favorites. EWEL prides themselves on using beans other than chickpeas to make their hummus. They also just came out with a line using greek yogurt which makes the product contain half the fat than regular hummus!